Does anybody know good videos or blogs or writing or whatnot for choosing a color scheme? As in, not just a basic overview of primary and secondary colors but how to have support in choosing a color scheme for your armies? For example, I want to paint a green army. What should my secondary colors be for? And after that, there are smaller questions like 'I have an orange and green armor scheme. What color should I use for my power-weapons'. So far I've found a lot of videos or blog posts seem more basic than that, but maybe I'm just looking in the wrong place. I also do know there is a ton of personal taste, but I'm not even sure where to start, especially for highlight colors. I'd recommand checking inspiration directly on google, and not limitating to dark eldars. "Warhammer alternate color scheme" or something. Not (at all) designed for miniatures, but you can also go for classical color tools if you got your main color. With settings "similar" or "triad" you can get some really cool suggestions. Also possess some user generated suggestions for themes. Choose your first color and add some randomly generated others ; but always working together. Yeah I'd have a look around what other people have painted and see what captures your eye that's how I started with things. It doesn't even need to be WH models really. Personally, my liking for tans and reds stems from my liking of the same in room decor (stained woodgrain and brick/red patterned fabric). What sort of colours do you like? I'm assuming green what sort of colours do you like in combination with green? The other thing is don't be scared to just give something a try if you're just getting started painting you're going to have a few duff models before you get into the swing of things. Try using them as trial-runs for paint schemes (useful if they're cheap models from eBay so you don't care too much about them). The green was actually just an example for conversation. I've been experimenting with black and white, gold for helmets and some armor highlights. 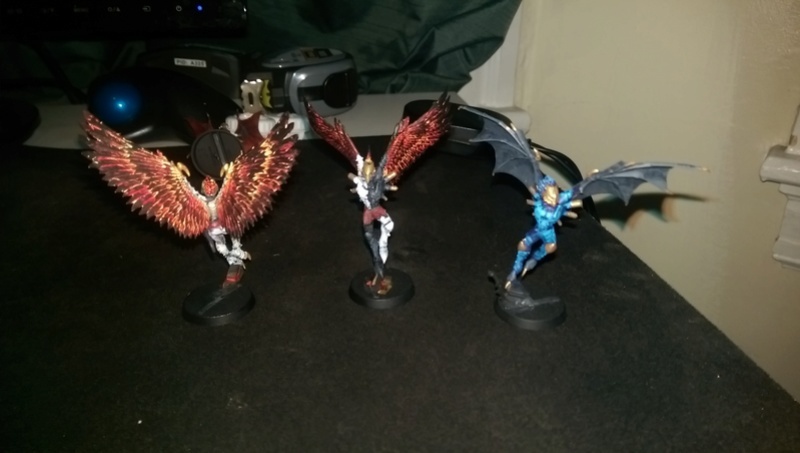 I also really really wanted to paint flaming wings, so started with that approach. They kinda overpower the other colors though, and pull me in a heavily red direction. the yellow recess on the flames also make the gold not stand out as much. I was originally thinking some kind of malal theme. I really like the fluff for the renegade god. Maybe some craftworld or crone world lost in the Eye of terror and corrupted by chaos even as they hated chaos and themselves at it. Also, I wanted to paint flaming wings. And I love fast moving armies but don't really like the jetbike models so was considering converting up some demon riders of some sort (maybe on white lions from the chariots box?). Also, flaming wings.... But it then forces red as one of my colors, to match, so I'm now reconsidering it. They turned out really well though. It's my first time painting since early high school 15 years ago, and man am I better at it! The black/white quarters contrasting one is my favorite so far, although I think the gold pops more on the all blue model. * I'm realizing I don't know how to take reasonable pictures of these. I'll try again in a moment. definitely the black and white with the red wings. Then build the same colours into your sails etc. on your vehicles and spot colours on your troops/characters. I think that will look slick. Wings tends to grab attention because they are missings guns. With black guns, with gold metallics, it should counter balance that and add more contrast. When wet/painting it will seems like colors are too distant, but don't dilute WS with Ulthuan grey. Do a test miniature & wait for to dry. From tabletop point of view it will be good (and the color distance really helps for clear painting). Also you can maybe try steps 1 & 2, and then edge highlight with mephiston red & smaller EH with wild rider red (kinda the look from obsidian color from GW painting application). Would be balsy and a good reminder of both flaming wings and dark eldar high contrasted green edges. Also consider giving a look to OSL tutorials (oriented source light), it's painfull & take a lot of time at the beginning, but rewarding when done correctly. And lastly, god those wings looks fantastic *-* I'm really jealous I didn't had the idea for my similar theme. Subject: Re: Choosing colors for highlights?